It had been since we saw a HTC get leaked, thanks to the company’s decision of releasing less but quality devices unlike last year. And when it does get leaked, it has to be by PocketNow. They guys have managed to get their hands on the HTC Golf (Codename) which is going to be an entry level Android Ice Cream Sandwich (ICS) running smartphone by HTC. It is being said that the HTC Golf will arrive with the official branding as HTC Wildfire C, joining its predecessors the HTC Wildfire and Wildfire S.
Going by the specs, the HTC Golf will arrive with a 3.5 inch touchscreen with a display of 480 x 320 pixels. There is no tip on the processor of the device but it could run on a 600 MHz processor at the least and a 1GHz processor would be a treat for the users. There could be 512 MB of RAM and about 4 GB of internal memory over the Golf. 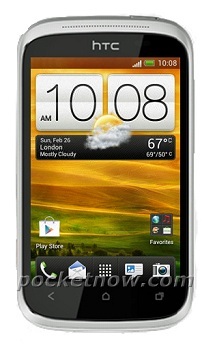 Other features may include microSD slot, Bluetooth 3.0, Wi-Fi, Beat Audio enhancement and maybe a front facing camera. As we know, HTC has partnered with Dropbox for cloud storage so the HTC Golf may also be eligible for a 2 years free Dropbox storage of about 25 GB. If we consider the price that the device may arrive at, then considering the specs, the HTC Golf may end up with a price tag of about $250 – $300. And if in case HTC does price it anything more than this, then it would surely be hard for the company to see the stocks piled up.